Do not fear the Souffle. You'll need a bit of organisation and the right equipment and it will rise. The cartoon and sitcom spoofs of old of Souffles deflating like the Hindenberg are quite a bit exaggerated. There are a few tips for the basics: 1. Sequester your Egg Whites before adding them to the bowl with all the whites. A bit of Yolk or a greasy mixing bowl will not whip well if at all. 2. Butter your baking dish very well. 3. Do not open the oven door until the rising and browning is down. Then the foam should be pretty stable. Try a basic one like this Cheese one and then you can experiment with the fillings. Enjoy! Butter an 8 inch / 2 quart (8c) Soufflee Dish thoroughly. Make sure to get into the corners. Put the Parmesan Cheese into the buttered dish and cover with foil or plastic wrap and shake to lightly coat. Set aside. Stage 1: Making a basic White Sauce or Bechemel. In a medium saucepan, melt the 4 T Butter and whisk in the Flour over medium heat. Whisk for 2 minutes to cook the flour and to emulsify the Fat with the Flour. Slowly whisk in the Milk. You may want to stop at 1 c to check consistency. Your relative humidity could change how much liquid your flour can absorb. Whisk until thick. Add a bit more milk at a time when it doesn't appear that it will not take the liquid and keep the thickness, stop. Add the Salt, Nutmeg and Cayenne and mix well. Take off the heat. Stage 2: Completing the Soufflee Base. Add the Egg Yolks one at a time whisking the whole time to avoid scrambling the Eggs by cooking them before they're incorporated into the Bechemel. Keep whisking until evenly distributed. Transfer to a large mixing bowl. Add the Cheese. Stir with a large Silicon Spatula (heat proof). Taste and adjust seasoning. Add Salt and White Pepper as needed not Black. Stage 3: Lifting the Soufflee. You can start the Egg Whites sooner if you're good at multi-tasking and have a stand mixer. In an Electric Mixer or with a Hand Mixer, beat the Egg Whites with the Cream of Tartar or Lemon Juice until they reach Stiff Peaks. You can turn the the bowl upside down or the head of the mixer back and the Eggs keep their 'Peaks'. Do not beat past this or they'll become too dry and can break up when incorporating into the base. Stage 4: Final assembly. Take a small scoop of the Whites and mix rapidly with the Silicon Spatula into the base. Don't worry about being careful. You want to lighten up the base slightly. Then add the remainder of the Whites in Thirds. Plop into the middle of the Base and Fold in: slice down the centre of the mound with your Spatula down to the bottom of the bowl and scoop/scrap along the bottom up the side, turn the bowl 1/4 and repeat until most of the white streaks are gone. Repeat until Whites are done. BE GENTLE. Pour into your Soufflee Dish. Bake in the lowest to bottom third (in our oven, we need to do lowest), level for 45-50 minutes. Check at 40 minutes but DO NOT OPEN the oven door after putting the dish in before this point. If it is too jiggly, leave it in. If it is too jiggly but browning fast, you may want to tent a bit of foil on top lightly to prevent burning. If the very bottom centre is a bit oozy when you serve, that's okay. It's all cooked. We normally put the dish back in the warm oven while we eat our first serving. You did a fantastic job with that souffle. The tips were right on too. I've never had a desire to make one, but that looks good enough that I might just give it a try. Thanks! Cheese souffle is my favorite!Your souffle looks delish! Gorgeous! 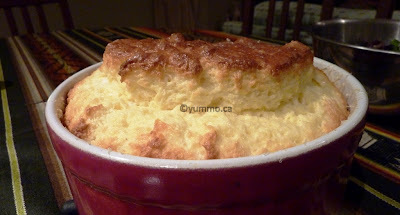 I'm totally making a souffle this week - maybe this one, I love cheese! I really loved this post. You describe this topic perfectly.